Disclaimer : The answers on this page are based on personal experience, information from the web sites cited here and the experience of others. For specific immigration questions please consult an immigration lawyer. For specific questions about licensure please contact the appropriate provincial licencing body (links and addresses are on this web site). I'm a doctor, can I immigrate to Canada? Yes, Canada has a yearly immigration quota (presently about 200,000/year) which hasn't been filled for the past few years. Further information as to the requirements for immigration to Canada are here. I have been approved as an immigrant, can I practice medicine in Canada? Didn't you sign a waiver saying you are aware there will be difficulties getting a licence or Canadian training before they gave you the visa? Even if you didn't sign one, if you didn't graduate or are not certified or licenced in the U.S., UK, Australia, New Zealand, Eire, or South Africa there are considerable obstacles to practicing medicine in Canada. First, all International Medical Graduates and Canadian medical graduates (including those from the above mentioned countries) need to pass Canadian exams plus the Test Of English as a Foreign Language, (really reasonable requirements since most countries in the world require their doctors to pass exams before practising, after all one has to be able to communicate with patients and staff and to show that one really has the required medical knowledge to practice in Canada, and these Qualifying exams are required of Canadian medical graduates too, excluding the the TOEFL and the evaluating exam), BUT THEN, for International Medical Graduates not educated or certified in the "favoured" countries (and even for some trained and certified in the U.S.) the education and/or specialty training are considered to be non comparable to Canadian standards therefore these International Medical Graduates are required to have additional Canadian training (not an impossible task but close to it for most) in order to maintain, so the professional regulatory bodies claim, the present standards of Canadian medical care, even after passing all the required exams (apparently it is the medical licencing authorities view that this just proves these International Medical Graduates are just as good as Canadian Medical Graduates when it comes to passing Canadian tests and nothing more which I must admit is a valid point). I've passed the Medical Council Of Canada Evaluating Examination, the Medical Council of Canada Qualifying Examination Parts 1 and 2 with scores over 520 on all exams and scored over 650 on the Test of English as a Foreign Language, can I practice medicine in Canada? Congratulations !!! You can now buy a nice frame and put the certificate in your living room to be admired by your relatives, friends and and other visitors (there are works of art that cost more than that certificate that aren't even half as nice). Unless you have the required training in Canada or were trained AND certified in the U.S., U.K., Australia, Eire, New Zealand and South Africa no province will grant you any sort of licence to practice medicine, not even a temporary one. You still need at least a year of Canadian training (with all the required rotations), or, if you want a Newfoundland licence, a pass in their Clinical Skills and Assessment Test. Please read the MCC booklet again. Which visa (J1 or H1b) is better for medical residency training in the United States? Leaving aside the exam requirements, for those not licenced to practise medicine in Canada or those not taking undergraduate or graduate medical training in Canada, IMHO (this is my opinion and I am not a lawyer), an H1b would be the better choice, although there aren't that many hospitals that sponsor residents on it. Just in case, after 4 or 5 years of training in the U.S. you find out that your training is not acceptable in Canada. Plus you don't have to go through all the trouble of getting the RCPSC Certificate of Recognition of United States Training, looking for a clinic or hospital that will give you an employment contract and not just a letter of intent (for some provinces a letter of intent is enough, for others an employment contract is necessary) to employ you 4 or 5 years later at the end of your U.S. training period, arranging your United States training schedule so you will be qualified to sit for the RCPSC or CFPC exams at the end of training (the RCPSC tells you when they give you that Certificate of Recognition of U.S. Training what their present requirements for that specialty are i.e. how long the training period is, how many research months are needed, how many months are needed as a supervising resident, what rotations are needed, etc. but NOT what the requirements will be 4 or 5 years into the future), getting a letter from the provincial health ministry saying the specialty you will be training for in the United States is needed in that province and an undertaking from the applicant that if you are not able to work in the hospital or clinic giving you that contract you are willing to work in an under serviced area for at least 2 years, all of which have to be secured between the time you get a written offer or contract for a U.S. medical residency position and starting it (since that RCPSC Certificate or any of those letters won't be forthcoming until you actually have the signed U.S. residency contract or offer clutched in your hot, sweaty little hands). An H1b on the other hand only requires you to have a United States hospital willing to sponsor you plus a lawyer (and of course the money to pay that lawyer, I am not aware of anybody going through the H1b process without a lawyer while I did the J1 process without one and all of the J1 visa holders I was personally acquainted with didn't need one either) to shepherd you through the process and you can apply for permanent resident status (Green Card) while on an H1B visa if you plan to stay permanently in the U.S.
On the other hand if you later decide to stay in the U.S. on a J1 waiver after the end of training you will have to start planning for that, at the very least, 2 years before the end of training, 4 or 5 years back you could plan for it a year or so before graduating from a primary care residency but not anymore (nowadays a lot of International Medical Graduates have to do a subspecialty fellowship and look for a J1 waiver area during their fellowship, if you can't find one you will have to go back to Tuqtayuqtuq or where ever after the 7 year maximum on your J1 visa has been reached since that is the only way, besides the waiver, you can change your status on a J1). I passed the TOEFL, all of the Medical Council of Canada examinations with flying colours but couldn't get the required training in Canada, so I passed all of the United States Medical Licensure Examinations and then trained in U.S. ACGME accredited residency and fellowship training programs, am certified in my (sub)specialty and licenced in all states in the U.S., will I be able to obtain a licence or Royal College of Physicians and Surgeons of Canada certification in Canada? What! And you'd still like to practice in Canada ? U.S. certified International Medical Graduates (sounds like U.S. DA certified beef doesn't it) are able to obtain licences in some provinces, i.e. physicians licenced in Maine can be permanently licenced in New Brunswick, temporary or permanent licences can be granted in Alberta, B.C, Manitoba, Newfoundland, Nova Scotia and Saskatchewan depending on geographical and specialty area of practice (not sure of the NWT, Yukon, Nunavut and since I can't read French I'm not sure about Quebec either), if the International Medical Graduate is going to practice in an under serviced area, temporary licences can be renewed several times and can be good for as long as 5 years. 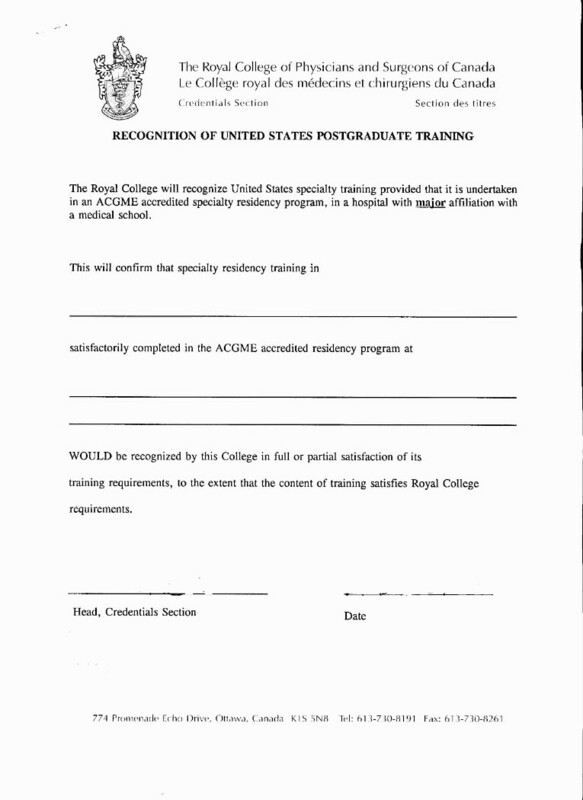 Getting certification from the RCPSC even for United States trained International Medical Graduates can be a problem since RCPSC presently requires that U.S. training be equivalent to RCPSC accredited Canadian training programs, the kicker is, most Canadian residency training programs are 4 (Peds and IM and in Quebec are now 5 years long ) or 5 years long (Anesthesia, Psychiatry, Occupational Medicine, Physical Medicine and Rehabilitation, etc.) while the comparable U.S. programs are only 3 or 4 years long (thus this U.S. Psychiatry professor needed 1 more year of training if he was to practice in B.C.). Combined residency training programs aren't recognized at all (since there aren't any in Canada). 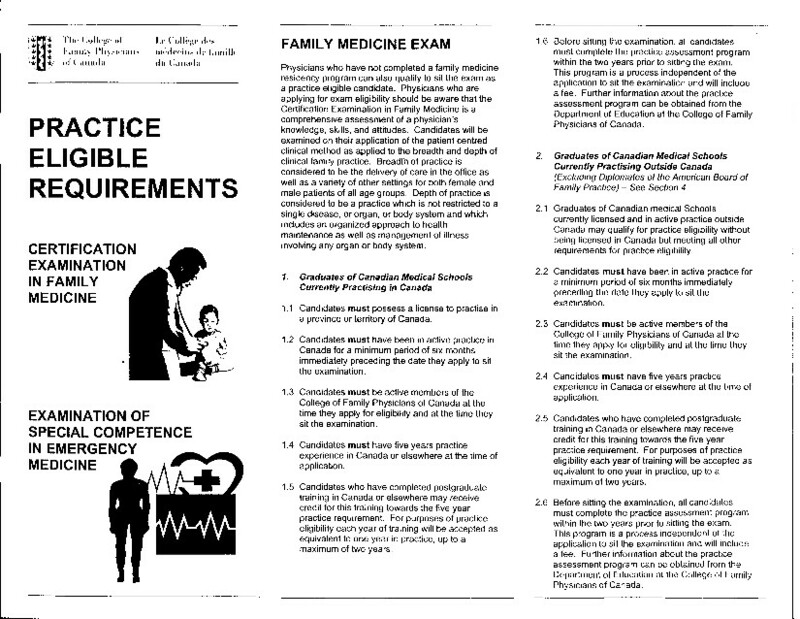 The College of Family Physicians of Canada has the practice eligible route to certification (1, 2) but one needs to have practised 5 years in Canada before being allowed to take the exam (the requirement is 5 months for those certified by the American Board of Family Practice and one still needs to take the CFPC certifying exam). Again a Catch-22 situation for most International Medical Graduates who can't get licenced to practice because they are not certified but need to have practiced in Canada, in lieu of Canadian training, to sit for the certifying exams. In addition since Canada has a federal form of government there are no national licencing standards and licensure in one province doesn't mean automatic licensure in other provinces, each province has their own standards and regulations for the practice of medicine and the medical regulatory bodies have individual discretionary powers as to whom to licence. For example, in Ontario, at present, the College of Physicians and Surgeons of Ontario requires actual Canadian training and won't even grant a temporary licence to those without such training, even to Canadian medical graduates who did their residency in the U.S. or lovelorn American OB/Gynes' (apparently sometime in the 70's the CPSO decided to be really fair and exclude ALL non Canadian trained physicians, including Canadian Medical Graduates trained in the United States or elsewhere, instead of making the process equal both for the favoured and nonfavoured International Medical Graduates, as a result Ontario now has cities like Kitchener-Waterloo, London-Hamilton, and Windsor with physician shortages). What kind of work can International Medical Graduates not from the U.S., UK. Australia, Eire, New Zealand or South Africa do in Canada then? Hey, Canada is a free country so you can do whatever legal work is available like being a care-giver, taxi driver, pizza delivery man or whatever to enable you to pay your taxes, place food on your table and a roof over your head. What about Canadians who study medicine abroad? Unless they went to school and were trained and were certified in the favoured countries they have to fulfill the same requirements as other International Medical Graduates and of course they cannot practise in Ontario at all. Can a landed immigrant live and work in the U.S. and still retain their landed immigrant status? Yes, as long as you get a minister's permit (from the Ministry of Citizenship and Immigration). You'd still have to pay taxes and maintain some sort of tie to Canada though. What if I don't want to go to the U.S. and I still want to practice in my own country? You could join the AIPSO in Ontario, the AFPA or AIMGA in Alberta or form your own International Medical Graduate advocacy group in your area, lobby your MLA, MP, (letters to MP's can be mailed without stamps as long as it is addressed to The House of Commons) the federal and provincial ministers, write or call the newspapers, radio and TV stations whenever they discuss the physician shortage or the state of Canadian health care, join the NDP (the only party actually on record as supporting IMGs), Canadian Alliance, Liberals, Tories or what ever political party you fancy so the power structure gets enlightened. If you just graduated from medical school this year you'll probably be 60 before you get to practice medicine in Canada, but hey, there are a lot of good 60 year old Canadian doctors out there. What's the purpose of this web site? To educate and inform the International Medical Graduate community as well as the general Canadian public in the hope that those in the power structure will see the light and to provide prospective Canadian IMGs with information they need so they won't experience what I did. And then maybe Canadian International Medical Graduates can practice in their own country (speaking for myself though, I can't wait 'till I'm 60 to practise medicine in Canada). 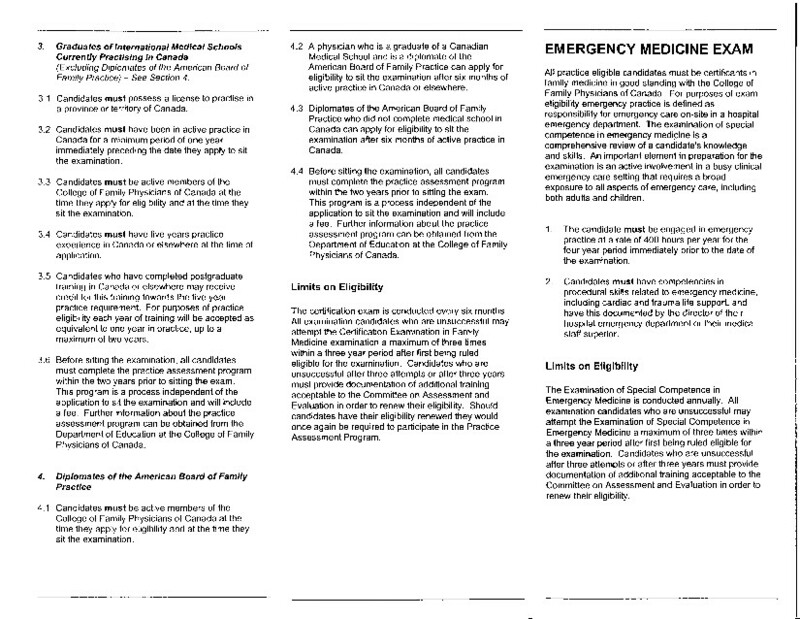 Since the prerequisites needed for medical licensure (even a temporary one) in Canada, unless you were educated AND trained AND certified in the U.S., UK, Australia, New Zealand, Eire, and South Africa, are extremely difficult to attain if not impossible for most, if your desire is to practice medicine in North America, take and pass (at least 85 or higher to ensure a good residency position) the USMLE, apply for a residency in the U.S. (although there may be obstacles too, it is much easier to obtain this medical training in the U.S. than in Canada) and plan on staying there permanently. Although welfare payouts may be lower, there is no GST, income tax rates are lower and there are places just as crime free and as beautiful as Lake Louise (maybe I'm saying it's a sweet lemon but believe me it's true).